Learn how this entrepreneur started a boutique winery in the Russian River Valley. Set in the heart of the Middle Reach of the Russian River, C. Donatiello Winery is dedicated to the production of this noble region's finest Chardonnay and Pinot Noir. Chris Donatiello earned his stripes in New York where he spent years marketing and selling a number of well-known, luxury brand wines and spirits. Taking his business expertise, combining it with his love of wine and entrepreneurial spirit, he came to the West Coast intent on creating a premium, boutique winery in the Russian River Valley. Chris teamed up with venture capitalist legend Bill Hambrecht, whose previous vine ventures include Gary Farrell, Ravenswood and Ridge. Together they acquired an old winery that produced 125,000 cases. They scaled it down to a sophisticated boutique winery producing 6,600 cases with state-of the-art equipment. "We focus on finding the best vineyards the Russian River has to offer, to make wines which are truly representative of the place from which they come," Donatiello explains. He is joined by fellow New Yorker Webster Marquez. Marquez trained in the relatively unforgiving grape growing climate of Virginia. From there, he worked in wine regions around the world before settling in Sonoma, first with Williams-Seylem, and then C. Donatiello. Marquez believes the Russian River Valley wines are unique in expressing their climate, vintage, and vineyards. At C. Donatiello he spends a considerable amount of time in the vineyards and in the lab, working to draw out those expressions from C. Donatiello's organically farmed, small-lot production. To this end, the winemaking operations specialize in artisan wines from estate and specially chosen vineyards in the Russian River Valley. Considering the soil properties and climate of their terroir, the winery is confident that its choice to focus on Chardonnay and Pinot Noir is the right one. 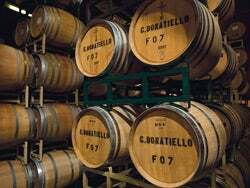 C. Donatiello Winery provides a quiet place to get away from it all. Its atmosphere is serene and rural, yet sophisticated. The winery's commodious, high-ceilinged tasting room has a homey feeling. It is complemented by koi ponds, a cherry orchard, a rose garden with more than 15 kinds of roses, and a sumptuous aroma garden, heady with fresh herbal and fruit scents that mirror the aromas of the wines. Strolling casually through the garden, visitors appreciate smelling and tasting the plants, herbs, and fruits which exemplify the scents found in Chardonnay and Pinot Noir. Like in the neighboring Maddie's Vineyard, organic practices are used in the garden. Whether on a formal tour, or a leisurely visit, callers are encouraged to pause for a bit and enjoy the stunning views of the Russian River Valley over lunch and a bottle C. Donatiello wine. Take Hwy 101 N to Central Healdsburg exit. Continue on Healdsburg Ave., turn left at Mill St., and continue on Westside Rd.